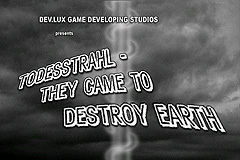 Welcome to Todesstrahl - They Came To Destroy Earth the latest game of the dev.LUX developing studios. Defend the earth against superior alien forces and become the superhero of the solar system. Use your maschine gun, rockets or the extraterrestrial disintegrator to fight back the invasion of the aliens. Â Rise to the rank of a general and twitter your highscore to compete with other players. Let's go, mankind counts on you!